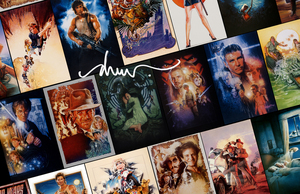 Drew Struzan is one the most famous and collected artists in the world, a true master in the field of cinema art, with private collections owned by George Lucas, Steven Spielberg, former Disney Chairman Michael Eisner and several other noteable collectors. With over thirty years experience and more than 150 movie campaigns under his belt, his noteworthy credits include Indiana Jones, Back to the Future, Harry Potter, the Star Wars trilogy and Star Wars: The Phantom Menace. He's painted memorable posters for Blade Runner, E.T. The Extra-Terrestrial, Hook, Cutthroat Island, Muppet Caper, Masters of the Universe and dozens more. After graduating with honors from the prestigious Art Center College of Design, Struzan first gained his reputation in the 70's illustrating album covers such as Alice Cooper's "Welcome to my Nightmare," voted one of the top 100 album covers of all time by Rolling Stone Magazine. In the coming years, Struzan developed his now-famous style of One-Sheet poster art, which includes such memorable works as Return of the Jedi and the international campaign for Raiders of the Lost Ark. In 1982, he embarked on a solo career that has earned him continuing accolades. Struzan's collectable work is held in high esteem having been exhibited at the Norman Rockwell Museum alongside other such American art masters as Dean Cornwell, Maxfield Parrish, and J.C. Leyendecker. Select famous works from Drew Struzan's career will be featured in this exhibit as well as contemporary personal works and high quality reproductions. The artist himself will be in attendance during the opening reception on Friday, February 13, 2009. This is a rare opportunity to view these culturally iconic works firsthand. The exhibit runs through March 2 and admission is free. For more details about this event, please feel free to contact us.